Club was a 2013 edition for the American market. 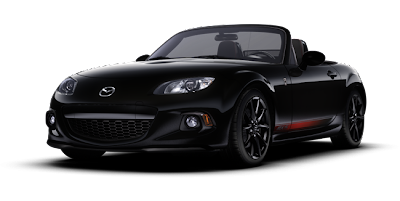 This version of the MX-5 is similar to the Kuro edition but with the steering wheel on the other side. 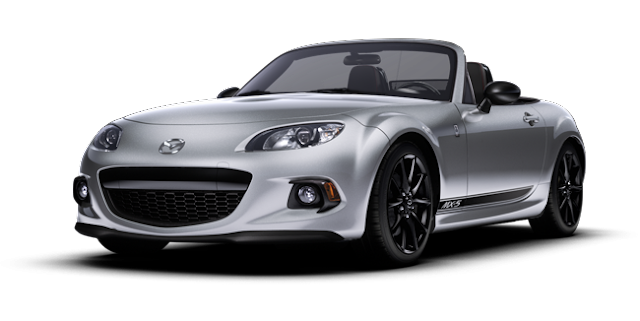 Available in both soft top and retractable coupe modes, the Club featured the 2.0 litre MZR engine giving around 167Bhp. Transmission choices were the 6-speed manual or 6-speed automatic transmission, with the manual version also fitted with the LSD. Four colours were available, Liquid Silver (aka Aluminium Silver), Brilliant Black, Crystal White Pearl, and True Red. The Club specification includes some desirable extras from the options catalogue and a few unique details. The most obvious of these is the Club wing badge and the MX-5 branded side stripe decals. Depending on which colour you chose, the contrasting stripe was either black or red with the MX-5 logo just behind the front wheels. I really like these stripes and would love to get hold of some for my own car. 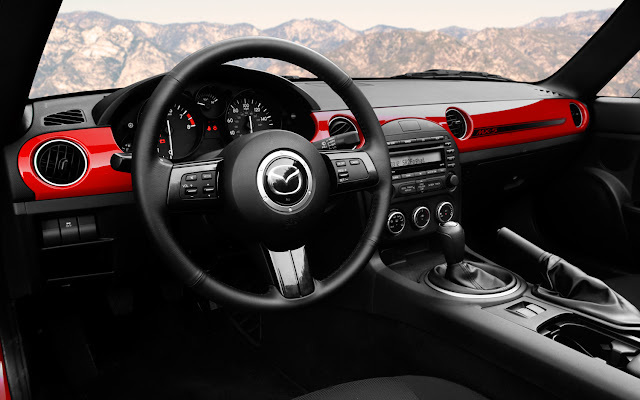 Inside, Club was fitted with body coloured interior dash trim with a contrasting stripe decal, again with the MX-5 logo. Club uses black electric wing mirrors and a black retractable hardtop to give a contrasting effect the same as previously seen on the Kuro and Sport Black editions. 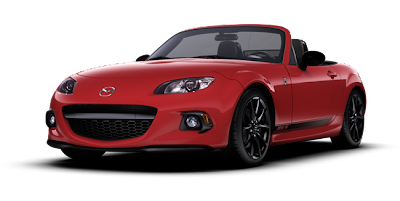 Something I've noticed with the facelift NC models in the USA is that they use the older curved style door mirrors instead of the newer design. I'm not sure why this is but they still look good so I guess it doesn't matter. The exterior graphics combined with the dark finish 17" alloy wheels, rear diffuser trim, and front airdam spoiler, also help give the car an impressive purposeful look. The looks are further enhanced with black inner headlight trim as opposed to the chrome or silver found on other models. Bilstein suspension with engine bay brace and LSD were standard equipment for the manual models, as were red stitched black cloth seats, air conditioning, front foglights, and cruise control.